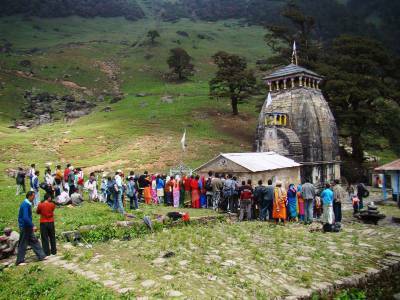 The Madhyamaheshwar Temple is in the Rudrapryag district of Uttarakhand. It is very serene and is one of the most visited tourist spots from Rishikesh. 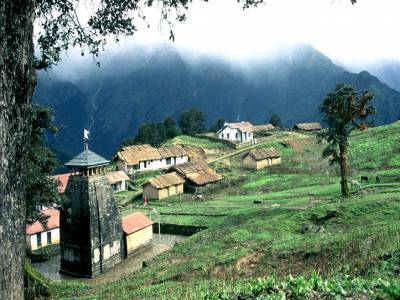 There are lots of beautiful natural landscapes, rivers, glaciers and bio diversities around this temple. However, its grandeur is drawn from the legends. As indicated in the classic Hindu epic, the Mahabharata, that the Pandavas went to the Prayag to cleanse their transgressions of war and kneeled for retribution before Lord Shiva. The Lord being maddened by their deed evaded the Pandavas in the disguise of a perfect bull. The Pandavas pursued the bull into the terrains & caves Garhwali Himalayas. In the mountains, satisfied by the Pandavas determination and contrition, Lord Shiva emerged before each & every Pandavas as a piece of that perfect bull. The places where these appearances took place came to be known as the Panch Kedars. The Madhyamaheshwar Temple is the place where the destroyer god Lord Shiva showed his divine grace from the navel cavity of the bull. The temple is based on stone engineering and is supported by the greenery of the Himalayas and the snow covers. The temple is made of black stone and a navel shaped Shiva lingam. 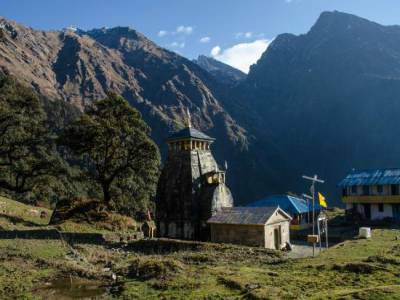 The Madhyamaheshwar and Rudranath temples are supposedly the toughest pilgrimage site to travel to among the Panchkedar temples as devotees have to travel 30 km and 21 km respectively on foot to reach there. The temple architecture is classic north Indian style. 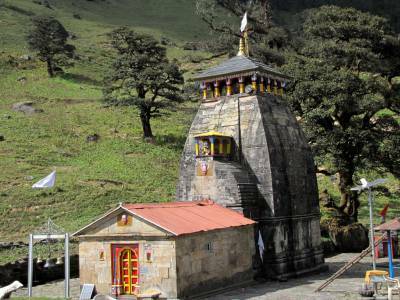 Other than being a religious destination, the Madhyamaheshwar temple is also a well-known trekking destination. It is a paradise for trekkers through the beautiful meads and mountains. The region is mystically covered by the snow-capped Himalayas and lush green alpine meadows and dense forest acts as its backdrop. 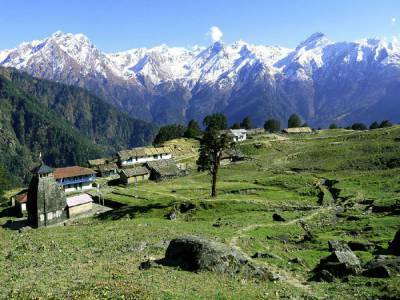 The region has rich flora and fauna, particularly the endangered species of Himalayan Monal pheasant and Himalayan Musk Deer in the Kedarnath Wild Life Sanctuary. The Madhyamaheshwar Temple is very accessible to the devotees and the travelers. Accessibility: about 58 km drive from Rudrapayag the closest town. About 196 kms from Rishikesh, about 220 kms from Hardwar, about 238 kms from Dehradun, about 442 kms from delhi, about 200 kms from Dehradun railway station and about 212 kms from the nearest airport. Accommodation: There are not so much choices regarding accommodation. Only accommodation available at this remote part is home stay. The people here are helpful, warm and honest. The lodging is obviously not luxurious but comfortable. Get quick answers from travelers who visit to Madhyamaheshwar Temple.